Learn all about how to "be a mermaid and make waves"
"When I grow up I want to be a mermaid!" "I want to be a mermaid for Halloween!" "I can't run, I'm a mermaid." Sound familiar? Then "mermaiding" might be the right thing for you and your mini-me’s. Mermaiding or mermaid swimming is fun way to embrace your inner mermaid and to learn how to swim and move like a mermaid, whilst wearing an actual mermaid tail! Mermaid tails are made of soft, stretchy fabric worn up to the waist and feel like a second skin. The monofin at the tail's end helps propel ourselves through the water. Swimmers move their bodies in a dolphin motion which engages all of the muscles through the legs and the core. The incredible speed drawn from the monofin is not only a ton of fun but is also extremely beneficial to your body. Tail sizes range from 7 year old kids to adults. Mermaid class encourages children to swim and get exercise while they are playing. It teaches children to use their legs in a strong kicking motion to better support a stronger swim style. Classes starts at 7 years old. Mermaid classes are a total-body workout from toning your glutes, quads and abs, combined with great cardio exercises working on breath control under water.Enjoy the benefits of stronger core muscles, higher endurance, higher flexibility in shoulders, spine and hips, and less back pain. 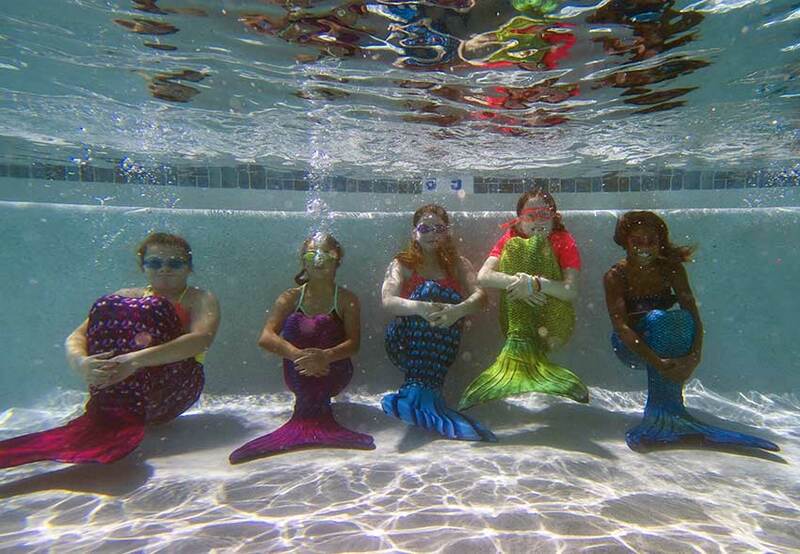 AquaMermaid is a hot new (mermaid) swimming school and is making its debut at Nitro Swimming in Cedar Park on October 6, 2018. Classes will be offered every Saturday for kids from 2-3 pm and for adults from 4-5 pm. Includes 1 hour of class and 1 hour of free swim per week. The membership classes teach more advanced movements and focus on fitness. Register for AquaMermaid classes here. We’re giving away (1) one set of 2 free Kids Mermaid Classes, a $120 value for a child and her/his friend, ages 7-12. How to enter: Like our Facebook page AND tag a friend on our Mermaid Swimming Facebook post (both actions required!). The giveaway ends at noon on September 26, 2018.